This is a minor update to Sandvox that solves a few uploading issues that appeared in 1.6.4, an issue with the iMedia Browser that only affects Snow Leopard users, and a few other issues. You will be notified automatically within Sandvox of the new version for instant download, or you can download Sandvox 1.6.5 directly here. Our freeware iMedia Browser is getting refreshed, in about a week. This new version fixes some of the same issues that are being updated in the new Sandvox, and also adds a Brazilian Portuguese localization. To get the updated version, just launch the current version early next month and you should be automatically notified. You can also manually update the software by choosing “Check for Updates...” in the iMedia Browser application menu. 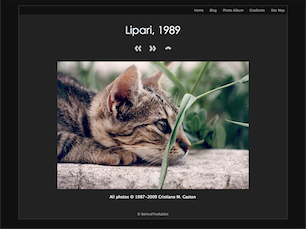 Or, you can always download the latest version from the iMedia home page. Photo (cc) by “zoonabar” on Flickr. We’ve teamed up with a couple of our recommended website hosts for the entire month of November and will be giving away a free single-user license to Sandvox Pro with proof of a new one-year hosting signup from either A2 Hosting or Server Logistics if purchased through the links on our hosting comparison chart. Here’s how this special, one-month promo works: You decide which plan you want, from either Server Logistics or A2 Hosting, and sign up for a year (or more) of hosting using the online form our comparison chart links to. Then, just forward the hosting company’s “welcome” email to ________. As soon as we receive your email and verify the purchase, we’ll send you a gift certificate code for a FREE single-user license to Sandvox Pro. This promotion starts now, and is effective throughout the entire month of November. Start here for free Sandvox license with hosting purchase. Important Notice: See offer page for further details. Offer applies only to new hosting signups and new or upgraded licenses to Sandvox. This offer is effective beginning midnight (Pacific) on October 28, 2009 until 11:59pm (Pacific) on November 30, 2009. If you are building a website that needs a custom banner, but you don’t have the skills to create the image you want, you may be interested in the service that Sandvoxer Karen Kaufman has just launched. The service, “Custom Headers by M” allows you to specify the Sandvox design you are using, the colors you want, and what kind of image you want. Check out the gallery of customizable designs, or commission your own. Prices start at just $10. Each month, we try to feature some of the newest Sandvox designs produced by our lively community of third-party designers. 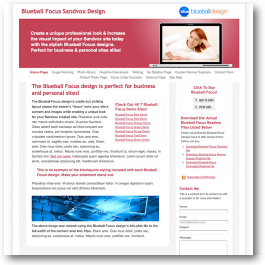 Blueball Design has created yet another elegant layout with their new “Blueball Focus” design. This is a mostly-white design with a splash of bold color in the banner area. Blueball has also released special bundles of their designs. Check out Volume 1 and Volume 2. Or if you’re looking for a dark look for your website, check out “Grafite” from BehindTheRabbit. This design makes wonderful use of subtle gradients to make an appealing background for color photos. Are you a Facebook user? Come by the Sandvox Facebook page! The group has been growing lately (along with Facebook itself) so please join us.